It is that time again guys and gals for makeovers galore all in part to Skin Fair 2019! A cornucopia of new mesh heads, skins, make-ups, shapes, tattoos and accessories galore all so that you can upgrade your existing look or completely give yourself a new one. Some of us would love for that to be as easy in the real world but it doesn’t work that way unfortunately which is why it is so much fun to be able to do it virtually through the Second Life platform. Batten down the hatches and bare with me as this post is very information heavy with quite a few pictures . This is my second post for the event (the first was pre-opening) so I have visual maps of the layout for all of you to click on and get an idea where you want to go before you even land. Just keep in mind that the first day or so will be pretty traffic heavy so if you don’t get in right this minute these items will not be going anywhere. The event lasts until the 24th of March which gives everyone plenty of time to do their thing. Vendetta is participating in this years fair and I am familiar with them for some of their releases from The Men Jail as well as Hipster Men’s Event. “Adrian” is one of three exclusives and has been created for LeLutka branded heads (Andrea and Guy respectively). The tones as you will see in the chart that I am going to post below are more golden in nature (think various tans). The face is mature yet still youthful and can be given a beard treatment to look a bit older if desired. A shape is included in the package but if you are first giving this brand a try, the body skins are sold separately at their in-world location which I will also provide a taxi for you in the style portion of the blog; if you are curious as to which tone that I am wearing I can tell you that I have on Tone 4. For someone who has an affinity for body ink, Skin Fair is going to be a treasure trove for me with many designers releasing tattoos as part of their exclusives or if they are only tat creators then all of their exclusives will be body modifications. Carol G., one of the fair’s proud sponsors has released this nifty (yes I’m old school so I can say stuff like that) tattoo called “Insight”. It comes in two versions (Black+White and Color) with 4 different pigments (Dark to Light). Looking at this tattoo closely you’ll be able to make out some familiar icons from pop culture fame (Hint: look on the back!) This is my first go round with Carol G. even though I am familiar with the name through various events but that is one of the great things about being a blogger for an event is that you can sample stores you may not have considered before. I’ll definitely be keeping a closer eye on the releases from this store, highly impressed with this tattoo for sure. This is one I’d recommend so now you know! As promised, here are the Skin Fair 2019 sim maps so you can begin to plan your mad shopping sprees. Enjoy everything that Skin Fair has to offer and be sure to come back as well to see what I’ll be featuring next from the event! 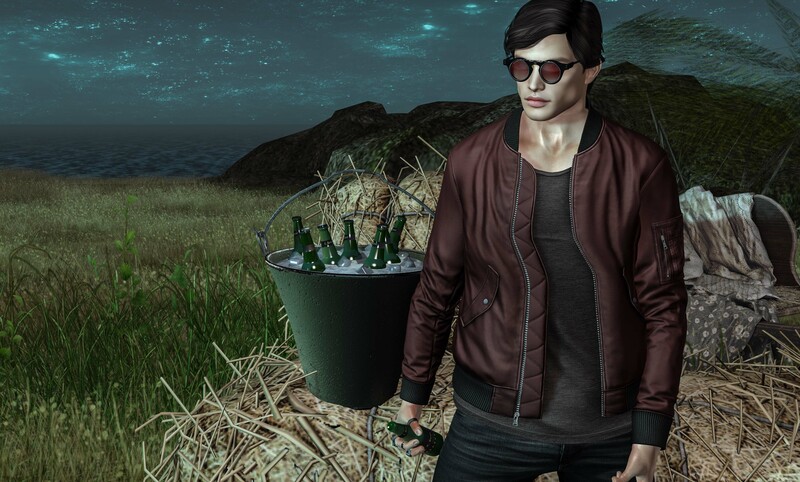 Transitioning from Skin Fair to another event just opening today is The Men Jail, where I am wearing a hair from L&E called “Helton” in Black (Blonde and Brown packs are also available). Style wise I would say it reminds me a bit of a modern mohawk and that prompted me to go the punk rock route with my soundtrack choice for this blog (in start contrast to last blogs dabble into Country). The Ramones were pioneers of the punk rock scene and have inspired many artists that have come after them and newer artists are being influenced by their music as I write this. To find a hair that reflects this type of music is something I feel is important to the overall theme of the blog entry. Now that you are aware (which you probably already were anyway) that there are new events open (Collabor88 has also opened today as well but I don’t have anything to blog from that but it is a point of interest) there’s no excuse to why you can’t start off your weekend with a little retail therapy and become a brand new you or find a new outfit or accessories. On that note I am going to turn you over to the much anticipated stylings of this blog entry and take a bit of a breath and gear up for the next exciting entry for me as I navigate through the wonders of Skin Fair and other events/items within my grasp. I can already assure you in the posts to come there will be some different things from me. See you around the corner everyone! The third month of the year is already here and somehow I felt as though I blinked and the first two months just happened to slip away from me. It’s been a few days since my last post but I’ve been kind of dealing with some issues outside of the virtual world and a few inside of it as well. It’s nothing major in the larger scope of things but enough to where it’s thrown me off kilter just slightly. Sadly it was a parting of ways with one of the brands I’ve been blogging for the longest since I started my journey and in some ways trying to get passed it was a harder hurdle than I imagined but after a lot of reflection, I truly feel like I was blessed to be a part of it and moving on is healthy and a part of the life cycle. I’ll be the first to admit though that change is not something I enjoy but dwelling on things isn’t a great idea either so I am looking at it as opening up a new opportunity with another brand who will utilize what I have to offer. Right now my main focus is on being a part of an event that I’ve enjoyed as a consumer and am now getting the chance to be a part of as a blogger. Skin Fair will be open in just over 3 days (at the time this gets posted it will be at least 3). While the majority of the event is geared towards females, I can tell you that I will make sure that the male equivalent of the event is featured and spotlight shown on the excellent skins, shapes, and add-ons (such as tattoos). This is my first post for the event so pardon me a bit if I’m a bit nervous doing this. Once I get in a post or so the nerves will wear off and it’ll be just like all the other stores that I promote as well as events (to which at the moment there is only one monthly one). Usually my look when it comes to shapes is normally something that’s been custom made for me or I tweak some that I’ve purchased. Skin Fair is a medium where I have the ability to test out shapes and show them in action (so to speak) as they were intended without any tweaking. Take for instance the shape I am wearing by West End named “Bradley”. 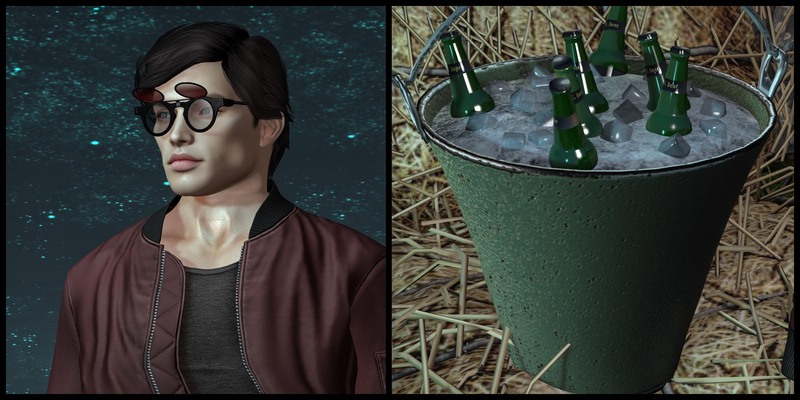 It’s for the new LeLutka “Guy” bento head and I think it looks very charming with lean and chiseled body features that along with the “Mario” skin by Stray Dog really sizzle. The second of my two Skin Fair featured releases is the “Bubo” tattoo from INKer. There are a lot of intricate things detailed throughout this skin such as the mandala type shapes as well as Native American influences. The back piece has a pretty awesome looking skeleton which really calls attention to it. Users of the Signature mesh bodies will be happy to have this ink in their aresenal but for those of you with other mesh bodies it will sadly not work for you as it is exclusive to Gianni and Geralt. I‘ve recently become a new blogger for the lock&tuft hairstore and this is my second official blog for the store. It’s truly an honor to be able to blog these hairs and also have had some input into recent ideas and names of them such as the “Stay Down” side swept hair that I am wearing for this look. There are a lot of fun color choices for you hair fanatics. The full packs are a great value and worth every single dollar spent on it (of course I mean lindens for those who might have wondered). To put it the best way I can, I feel the look I’ve put together has a combination of edge along with sensitivity which meets up with the song of choice for this entry. Captives is a fairly recent band that I’ve discovered who only have two single songs out one of them being “Signs” which speaks to me loud and clear as I have felt quite a bit of what the lyrics are talking about. Some days I feel the weight of anxiety as if it were a ton weighed upon my chest and a lot of times I don’t feel like I should burden anyone with it which is not a great idea but that’s one of the reasons that I have this blog. I can take pictures and write about things if I want to so that I don’t have to drag anyone else down with me on the days that I’m not my best. Getting back to lock&tuft, it is a brand I’ve followed for some time and believe it will continue to grow and prosper and I look forward to seeing this first hand. This hair is badass and you can find it at Men Only Monthly which is only about halfway through their current February/March round. Now that I’ve just about finished my first entry for Skin Fair I feel a little bit more relieved which I was hoping to feel by the time I got to the end. From some of the items I’ve looked through I can definitely say that I’m going to really enjoy sharing them with everyone and if any of my posts help even one person to take a trip to Skin Fair then I’ll have succeeded in my mission. On that note it is time for me to hand the baton over to the style credits and let them do their job. You know where I got the items now you can go grab them yourselves (except in the case of Skin Fair as it doesn’t open until the 08th). Get your shopping on and I’ll see you all back here soon for more cool swag and news.